iPad 5 Release Date Nears: What Will the New iPad 5 Be Like? While many people are focusing on the next generation of iPhone or iPad mini, the iPad 5 release date itself is perhaps more important. The iPad 5 is expected to be Apple's best-selling iPad, and there are lots of rumours already about what the new iPad 5 will be like. The iPad 5 will make an appearance in October according to a new investor note from Citigroup. These new release dates match up with Tim Cook's comments at the Apple Q2 earnings call, which brought news that Apple's new products and services won't arrive until the fall. The iPad 4 is currently on store shelves, launched in late October 2012. This would mark a full year between iPad releases, restoring the previous Apple update cycle. If there's one thing that everybody seems to agree on, it's that the iPad 5 will be based on the iPad Mini. In other words, it's going to have narrower bezels and be a lot thinner. 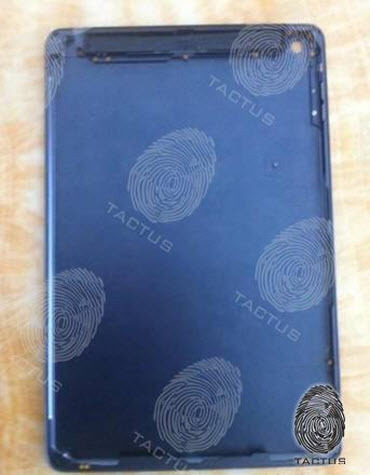 The latest leak comes from Tactus, with a picture that allegedly shows the rear shell of the iPad 5. It's hard to tell anything from the low-resolution photo, but what you can see is that the rear shell shows a tablet that's thinner than the iPad 4. A latest report that hit the web Monday saying the iPad 5 would feature some of the design traits of the smaller version of the flagship tablet - iPad mini. "We think the tablet will, at 7.5-8.0mm, be 15 percent thinner than iPad 4. The new device will likely be about 500 grams, or some 25 percent lighter than iPad 4, run on an A7X processor, and sport cameras with similar specs to the iPad 4's (front HD, rear 5MP). The casing shape and color (silver and black) and narrow bezel design will be similar to the iPad mini's," according to KGI Securities analyst Ming-Chi Kuo. He also claimed that the next flagship of the Apple's iPad will also feature some of the specs of Apple's iPad Mini like the multilayer-glass-based GF2 touch technology which will trim down the thickness and allow the iPad 5 to be even thinner than its antecedents. If Apple could make the iPad 5 look and feel like an iPad mini, would that be your next iPad? iPhone 5S rumours keep on coming. Read on to see the latest rumours about iPhone 5S release date, features, new design. Pull a long face snoot for inability to import DVD to iPad? Take it easy, MacX DVD Ripper Pro brings you an ultimate solution to let you copy and rip encrypted DVD movies to iPad via a few clicks. Eager to play YouTube video on the new iPad? Hold on, this tutorial shares you a wonderful iPhone video converter and tells you how to download and convert video from YouTube to iPad easily, so that you can play YouTube video on iPad anytime anywhere.